Afghan Hounds are long-legged hounds, built for speed and endurance, who traditionally hunted game by sight over rough terrain. Although somewhat aloof and dignified with strangers, the Afghan Hound is very clownish and playful with friends and family. 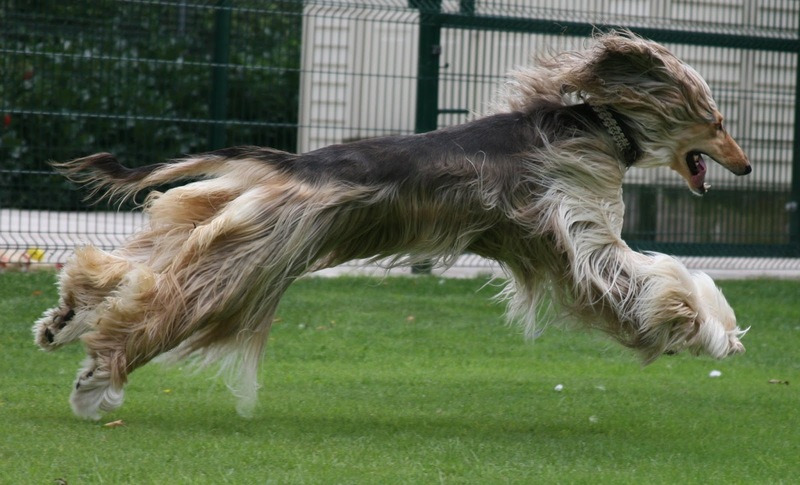 The Afghan Hound comes from Afghanistan, where the original name for the breed was Tazi. Regarded as an ancient breed, the Afghan type dates back thousands of years. In days gone past, sleek, lithe pariah dogs assisted desert nomads in hunting. These early dogs became the base on which the Afghan was built. 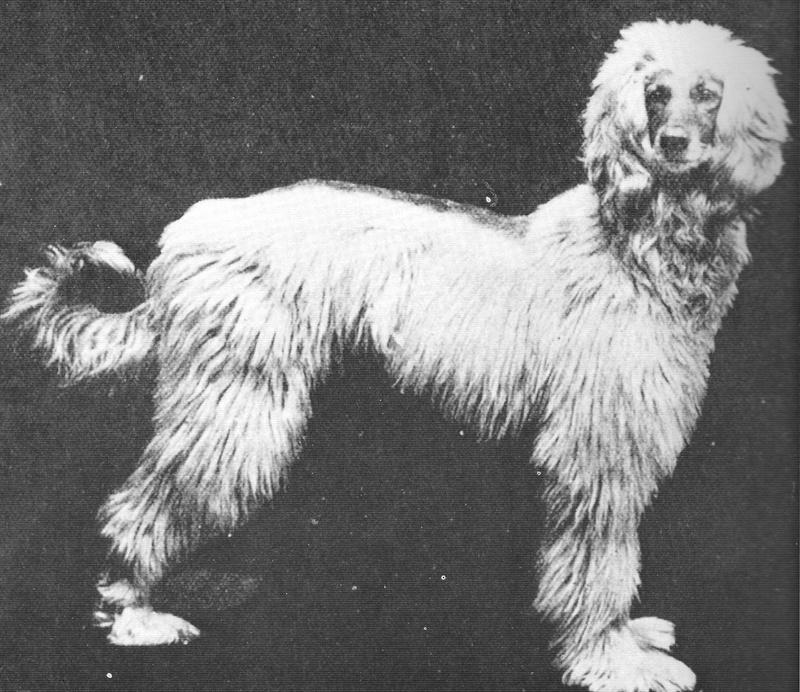 Used as a sight hound to chase down game, the Afghan was different from other early hounds of Northern Africa in that it developed a long coat for protection against the extreme weather conditions in the Afghani region. 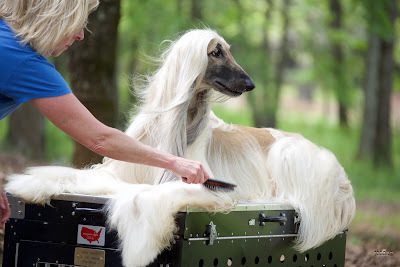 Introduced to the Western World at the turn of the twentieth century, the Afghan Hound became popular in the 1920s and again were very trendy during the 1970s. Often described as a dog of regal and majestic stature. 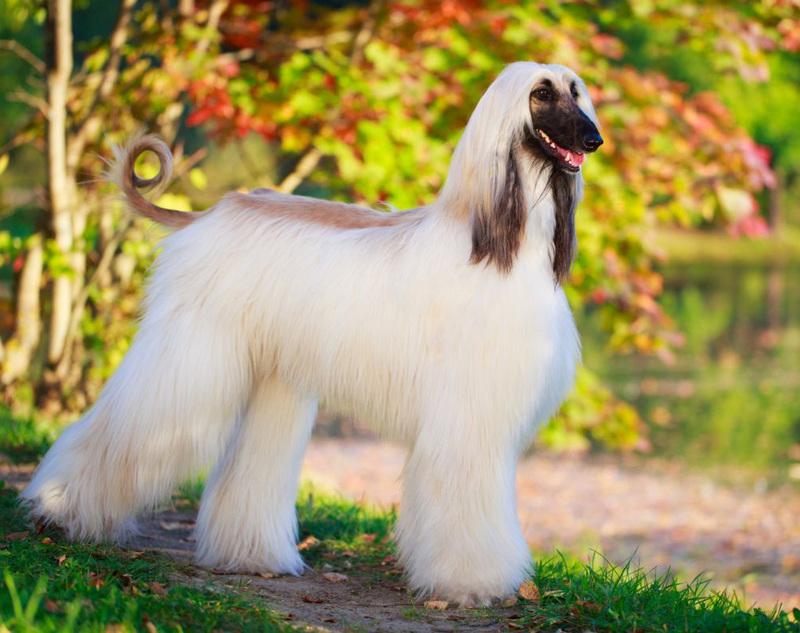 The Afghan is most noticeably distinguished by its silky, flowing coat. This fine, single coat is long all over apart from the top knot, or brow, and over the ‘saddle’ area on the back. It may appear in all colours ranging from solids, brindles, black and tan, or black-masked golds and black-masked silvers. These types are a fawn, cream or blond colour apart from the face, which may be gold or silver. Height ranges from 62-74cm and weight from 25-30kg with the males usually at the upper end of the scale. For the full breed standard, please visit the ANKC website. The Afghan displays classic ‘gazehound’ or sight hound conformation – long legged, light boned, and deep chest to increase lung capacity, and a long back with wide, flexible vertebrae to allow for maximum propulsion at a gallop. Their lean physique, with a high muscle to fat ratio made the type not only more powerful over the ground but also allows for a more efficient consumer of food. Traditionally, there was no benefit in owning dogs to chase down food for the camp if those very same dogs required substantial feeding too. Most sight hounds of various breeding have a similar temperament – aloof, independent and very active. Afghans are particularly active in the mornings and evenings. The Afghan’s temperament has been known to range from shy to sociable to aggressive. The breed’s popularity in the 1970's lead to indiscriminate breeding and consequently aggressive tendencies evolved. A decline in popularity lead to only the more dedicated breeders remaining which allowed for the more responsible breeders to make the Afghan Hound a more sociable animal again. Regardless, the pedigree Afghan is still a breed of fairly recent domestic origins and it should not be forgotten that it is a dog long-bred to catch and kill other animals. Hunting instincts are still very strong and an Afghan can make for a fiercesome sight when agitated. They do make for good watchdogs and can be vocal at feeding time. Responsible owners really can’t get away with less than a couple of miles walking morning and night. And although the breed does like indoors living, breeders recommend at least an average sized yard. 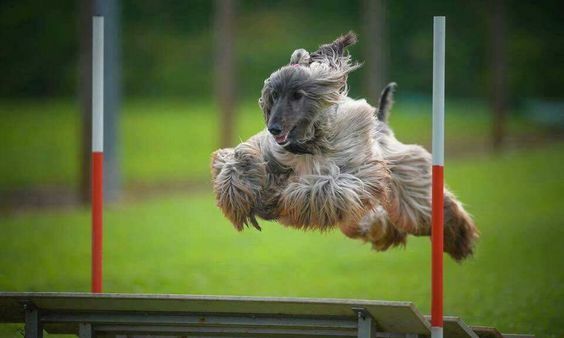 Afghans are now even being seen at agility club events. 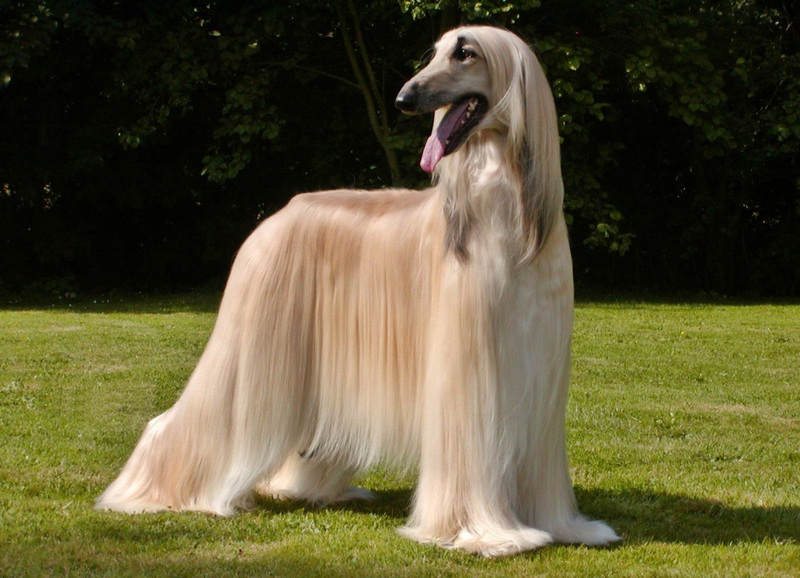 The Afghan Hound is popularly regarded as the most unintelligent of breeds. The Afghan’s independence and aloofness is most apparent during training. Breeders say that basic commands are still no problem however more advanced obedience and exercises such as fetch and retrieve are not the breed’s forte. Breeders say that reports of incidence of Hip Dysplasia and juvenile cataracts do not amount to substantial problems within the breed, but regardless, professional, responsible breeders do test for these conditions. Ask to see certification that the pup's parents are free of these conditions. Breeders have also reported some incidence of undershot and overshot jaws. As this will affect a dog’s ability to eat, always examine the pup’s mouth before purchase. Afghans enjoy a reasonably long lifespan, around 12-15 years. The amount of grooming can depend on whether the dog is for show or just a pet. Show dogs are bathed and groomed once weekly – about three hours per dog. Pets may be clipped off and bathed once monthly. At least a once weekly groom is essential, about 30 minutes to an hour, depending on the condition of the coat. More regular grooming will keep the coat in good order and free of knots and matting. Afghans display a seasonal moult every six months. Afghans appeal to an amazing array of people. Their stylish stature has captured the imagination of all walks of life. They are very energetic and don’t really suit a town house or an owner who doesn’t have time to spare for exercise. Breeders say that they are fine with children, and not as boisterous as other large breeds. They are best suited to owners who are prepared to groom and exercise their dogs regularly.